The bike multitool is one of the most important piece of tool you should have in your saddle bag. It doesn’t see much use on most days. But when you need it, that’s when you realise how important it is. 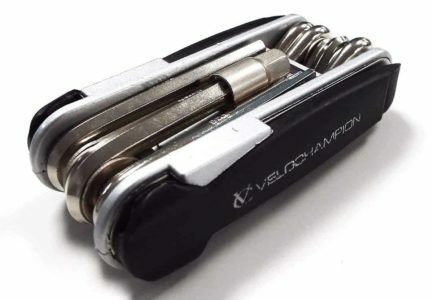 Often being touted as the cyclist’s Swiss army knife, the multitool comes with many functions. But the question is, which one do you really need? There are hex keys, torx drivers, screwdrivers and even chain splitters. And to complicate things a little more, they come in various sizes as well. So, here are some of the best bike multitools available today. 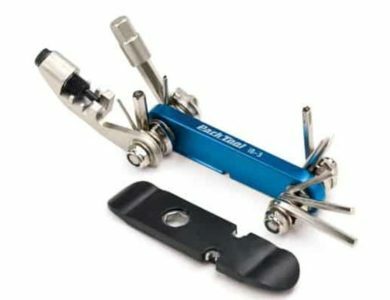 The Park Tool I-Beam is, for all intents and purposes, the standard multitool. If you pry open a bike mechanic’s personal saddlebag, odds are you’ll find an I-Beam in it. 10 tools include hex wrenches, a Torx driver, and a flathead screwdriver, all weighing in at a mere 108 grams. If you’re looking for the perfect blend of weight and functionality, then look no further. Topeak gives Park Tools a run for its money with their Mini 6. Weighing in at a scant 73 grams, the Mini 6 has a nice range of tools including a Phillips screwdriver and range of Allen wrenches. With an aluminum body and chrome vanadium steel materials for the tools, the Topeak is hardy for its weight. If you’re in need of a basic tool that gets the job done, then this fits the bill. But, if you need Torx bits, look elsewhere. The Pro Bike tool 8-in-1 features an innovative design that we really enjoy. 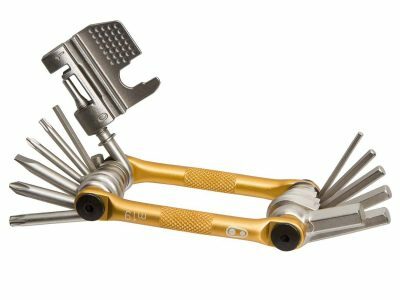 Instead of the usual Swiss army knife setup that many multi tools tend to employ, the Pro Bike Tool 8-in-1 aligns its tools along a thin and stylish stainless steel band. Usually, multitools are quite small to grip making it hard to gain leverage. But with the Pro Bike Tool 8-in-1, the long handle makes for a nicer surface to really wrench into tight and stubborn bolts. Fabric made a huge splash in the cycling world when it introduced cageless water bottles holders a few years back. They followed that up with a line of saddles that took an entirely different approach to ergonomics and bike fit. 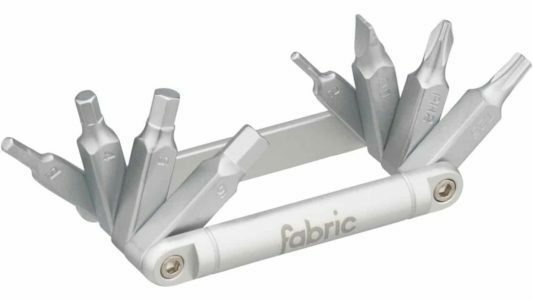 Clearly, Fabric thinks they do it better, and it’s hard to disagree. Their 8-in-1 multitool takes the compact design of the classic Park Tool I-Beam and makes it more angular, denser, and sturdier. The CNC machined steel tools have 360 degree range of movement to get into hard to reach places, and at 84 grams, you’ll hardly notice it in your saddle bag. Blackburn is a mainstay in the bike tool industry so expect no frills and pure performance from their Heist 10 Multitool. At 145 grams it’s a bit heavier than other options, sure, but with the added tools that might make the difference between getting home and not, we can’t complain. There are plenty of hex keys, a Torx T25, and both Phillips and flathead screwdrivers make this tool perfect if what you need is a saddlebag mainstay that won’t let you down. It comes with 19 different functions including hex and open wrenches, three different screwdrivers, spoke wrenches, two Torx drivers and a chain tool. 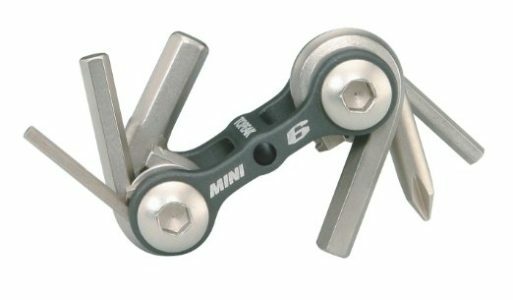 This is probably the multitool that bail you one in most situations except the very complicated ones. 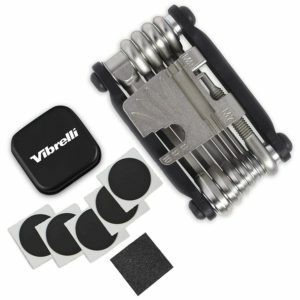 The Vibrelli V19 is clearly meant to compete with the Crank Brothers M19 and features a nearly identical toolset and build. If you’re trying to decide between this and the Crank Brothers M19, the perks of the Vibrelli include lower pricing and an included puncture repair kit. Additionally, the lifetime warranty offered by Vibrelli is a great bonus to riders concerned with staying covered. The IB-3 has everything cyclists love about the IB-2, but with the addition of a suite of tools to get you in and out of the toughest situations. 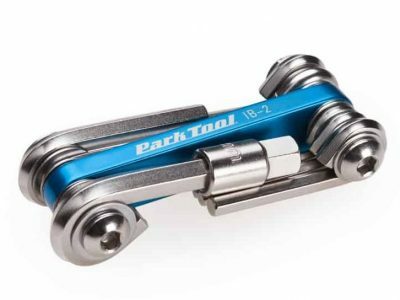 Park Tool’s standalone chain tools are award winners, so you can expect that their multitool integrated versions are worth your money as well. Instead of including a few different screwdriver tools like the Crank Brothers M19, the Park IB–3 includes a pair of tire levers which also has a spoke wrench built-in. The Mini 20 delivers on size and functionality with over 23 different variations possible between all of the included tools. Working on hydraulic disc brakes on both road and mountain bikes on the fly is a cinch with the included Torx wrenches, and the included neoprene bag and self-tightening tool keep the Mini 20 in top condition. VC Bike is a newer entrant to the multitool space and make their debut with the Gooj 3. The Gooj 3 lacks in functionality compared to the other multitools mentioned above, but it does come in ahead of the pack on price and the inclusion of two tire levers. Additionally, the Gooj 3 comes with a chain breaker tool that could really come in handy if you ever run into a chain issue mid ride. When choosing a multitool for your bike repair needs, keep in mind that first and foremost, the bike tool will be there to bail you out when you need it most. That means you’ll be relying on your tool in the middle of nowhere, or stranded on a rainy day along a country road some place. For those reasons, it’s important to take note of the quality of your multitool since the last thing you’ll need is for it to fail on you. There are super lightweight options out there that use feathery materials. But consider this, is it worth going for a material that handles less stress than something like stainless steel? 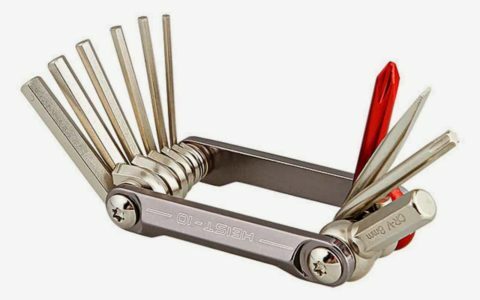 Your multitool choice should be the most quality piece of kit in your saddlebag because it’s the thing most likely to save your ride, not to mention your day. PRO TIP : Go for a multitool with the highest build quality that’s within your budget. Bike multitools come in various sizes, weight and ultimate the number of tool functions. You’ll often see them being labeled or described by their number of functions. Generally, the more functions a multitool has, the bigger and heavier it is. Add in a high quality build, you might be looking at a heavy multitool. Try to find a good balance between weight and tool functions. 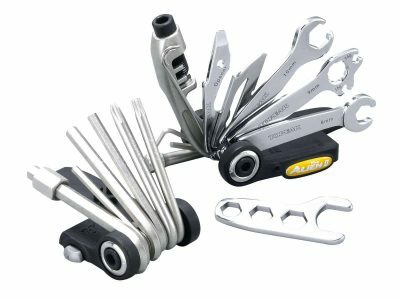 These multifunction tools can come in the combined form of Hex wrenches, spoke wrenches, Torx drivers, screwdrivers, chain breaker tool and sometimes even tire levers. Even with Hex wrenches itself, there can be multiple sizes from 2 to 8, or even higher. So, knowing your bike and what tools it needs is the first and best way to determine the your multitool choice. PRO TIP : Spend 5-10 minutes checking out the various bolts used on your bike. If unsure, consult your local bike shop’s mechanic. 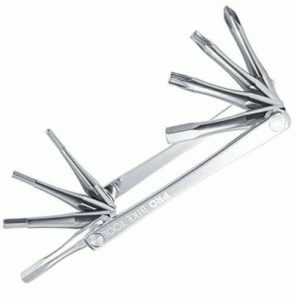 While many multitool functions are optional, there are a few that are necessary. These 3 tool functions are the must-have in your multitool, regardless what your bike set up is. Also known as allen keys, the 4/5/6mm hex keys are most commonly used. They can be found on almost all bolts in bottle cages, headset, stem, seatpost, chainrings, derailleur and shoe cleats. If you’re using a Shimano, Look, Time or Speedplay pedals, then you’ll need a 8mm hex key in the event you’ll need to remove them (very unlikely). If you’re at home, a pedal wrench would be a better tool. Smaller, compact sized multitool like the Park Tool IB-2 doesn’t come with a 8mm hex key. It has a removable adapter that converts from 6mm to 8mm hex key. The torx head has a 6 pointed star pattern. Over the past 5 to 6 years, bike component manufacturers like Fizik, Zipp and SRAM are increasingly leaning towards using T-25 bolts in their components. The reasoning is simple. 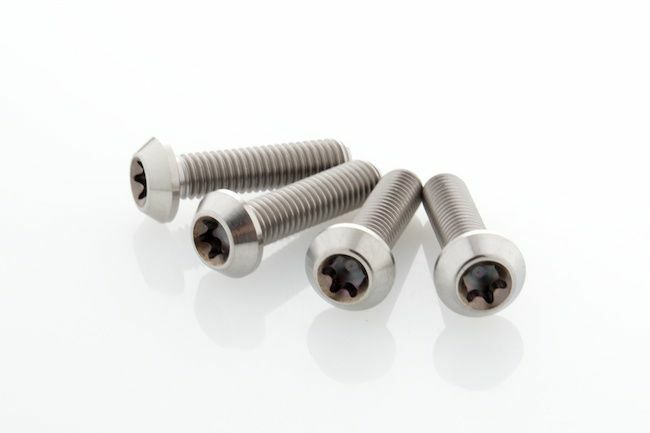 With hex bolts (especially those 3mm and below), they’re prone to being stripped out over times. The 6 pointed star pattern allows you to exert a higher torque on the bolt head compared to a hex bolt. Among all the torx drivers, the T-25 is the most commonly found in road bikes, especially in stems, chainrings and disc rotor bolts, depending on the brands. The screwdrivers need no introduction as they’ve been around for ages. Make sure you have the 2 most common screwdrivers, the Phillips and flathead. While they don’t see much use these days except adjusting the limit screws in the derailleurs, they do come handy for other purposes. For example, trying to unscrew a washed out hex bolt. PRO TIP : The 4/5/6mm hex keys and T-25 torx key are the must-haves in your multitool. If your multitool has all of the above covered, then you can start thinking about optional additions to the pool if you don’t mind the extra weight penalty. Think about this : What type of riding are you doing? That’s an important question to consider when deciding the additional features that you’ll need in your multitool. Commutes and bunch rides. If you’re doing daily commutes around urban areas, or your regular bunch rides, then you might not need these optional tool functions as help is just around the corner if you need it. Solo. If you’re riding solo in remote areas, then you’ll more likely to need these optional tool functions to bail you out. It’s quite rare these days to have a broken bike chain mid-ride unless you’re really unlucky. A good habit is to ensure your bike chain is always lubed with the right chain lube. Having said that, it still happens. You’ll need a chain breaker such as the Crank Brothers M19 multitool to break the chain links and join the broken chain together. Alternatively, you can also join the chain using a masterlink. Spoke wrenches definitely come in handy if you’re deep in the remote areas and break a spoke. But bear in mind that you’ll also need to bring along replacement spokes. A spoke wrench without replacement spokes is as good as useless. To do this job, the Park Tool IB-3 is one of the best around. It comes with a spoke wrench, tire lever and chain breaker in addition to all the different hex and Torx keys you’ll also need. Some multitool come with a CO2 tire inflator built in. This way, you don’t need to carry a separate one. But bear in mind that having a built in CO2 might make the multitool becoming bulky.